Part Jedi sanctuary & spiritual symbol of most ancient Ireland, pick up your keys at one of our two Co. Kerry car hire locations and start a road trip to Skellig Michael that encompasses spectacular scenery, bustling towns, ancient monuments & captivating wildlife. Book your car rental with Budget & take a trip to the edge of the Atlantic where this rocky island off the coast of Ireland rises majestically from the sea. Kerry is a county that boasts a wealth of attractions that few other places in the world can match so a canny adventurer would surely take the long route to Skellig Michael to fully experience the magic of Co. Kerry. For those on a shorter timeline to get to Skellig Michael you can mix & match the points of interest from this road trip to suit the time available. Day 1: Begin the journey in Ballybunion in North Kerry taking in the spectacular castle & beach in the region. Day 2: Next - turn your wheels towards Tralee, for a stay in this bustling county town, full of activity & entertainment. Day 3: A pit stop in Dingle - meet Fungi the dolphin & sample some of the culinary delights on offer in its many great restaurants. 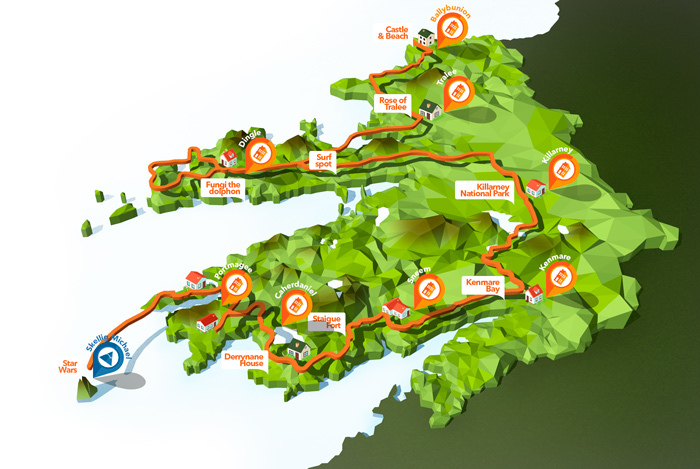 Day 4: Take the Slea Head Drive - this circular route starting & ending in Dingle not only provides breathtaking views, it also plays host to some of Ireland's most ancient monuments, forts & other heritage sites. Day 5: Park up at Inch Beach - one of the most beautiful places on the Dingle peninsula. Here you can enjoy a spot of surfing or simply relax & enjoy the tranquil surrounds before the next leg of your journey to Skellig Michael. Day 6: Explore Killarney, taking time to include a visit to Killarney National Park, Muckross House & Torc Waterfall as you drive. Day 7: Set off through Molls Gap to the lively town of Kenmare for an evening of traditional Irish music & entertainment the town is known for. Day 8: Getting ever closer to the famed Skellig Michael, navigate your car via Sneem & Caherdaniel with a visit to the historic Staigue Fort & Derrynane House well worth stopping off for. Day 9: As you drive towards Waterville this is the real start of your Skelligs experience as you take the turn marked Skellig Ring. Only cars are allowed on these small, country roads. Day 10: Travel via Ballinskelligs through the charming village of Portmagee with it’s scenic harbour views and cross the bridge to Valentia Island. Numerous boats are available in each of these 3 locations to take you to explore this iconic island. You’ve travelled winding roads & navigated the Atlantic waves to experience the jaw dropping impact of the truly unique Skellig Michael - a place special enough to be inaugurated in to the Star Wars galaxy and a place of refuge for the Last Jedi! Scale the 600 narrow spiral steps, re-imagining the path of the monks that once called it home and revel in the wilderness and rugged beauty that makes Skellig Michael a force to be reckoned with- just ask Luke Skywalker!